Entry to Banff, Jasper and Yoho National Park. Enjoy the metropolitan city of Toronto. Check out the famous Niagara Falls. Spend time in the Canadian capital of Ottawa. It’s currently low season in Canada. 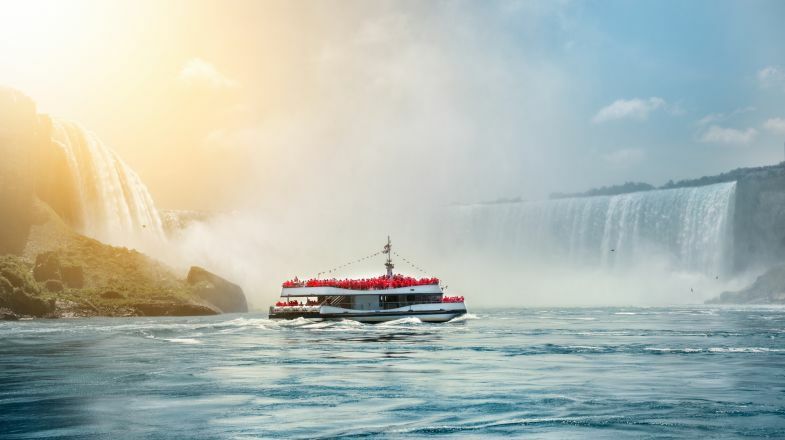 Prices are good, and Canada's attractions aren’t crowded. Discover one of the most awe-inspiring mountain ranges in the world: the great Canadian Rockies. Climb aboard the epic PEAK 2 PEAK Gondola and be transported from Whistler to the Blackcomb Mountains, keeping an eye out for black bears in the forest below. Ride a canoe to an outpost of Sun Peaks and enjoy a four-course meal in the style of the old fur traders. Ottawa: Join us for a Highlight Dinner at the Courtyard Restaurant – a culinary experience that will delight your taste buds..
Quebec City: Dine at Chez Rioux & Pettigrew, a modern eatery and bar showcasing creative, seasonal dishes that celebrate artisanal meats and local seafood..
Montreal: Celebrate with wine and good cheer at Gibbys in Old Montreal..
Banff View stunning mountains and waterfalls on your sightseeing tour. Icefields Parkway Discover Peyto Lake and the Columbia Icefield before riding a giant Ice Explorer across Athabasca Glacier. Jasper Enjoy an orientation tour of this charming town. Explore some of Toronto’s coolest neighborhoods. Marvel at the world-famous Niagara Falls. Attend a wine tasting at a local vineyard. Orca, Humpback and Grey whale watching with experienced naturalist guides. Search for Black bears on the rocky shoreline of Clayoquot Sound. Observation of the 'mythical' Grizzly bear in its natural surroundings. Soak the evening away in the Miette Hot Springs. Spot iconic Canadian wildlife in scenic Banff. The beauty of this trip is that it covers the best of southern Vancouver Island in a fairly short space of time. Best surf town, best beach town of 2016… the list goes on for Tofino. Whale-watchers find themselves in heaven. Guided walk on the incredible Athabasca Glacier. Relax in the Sulphur Mountain Hot Springs in Banff. Unearth adventure in all-action Whistler. Unique overnight wilderness canoe trip. Two days in Banff National Park with numerous hikes. Entry to Glacier National Park. Drive the Sea to Sky Highway. Canada certainly looks good, but it isn’t just about looks. It also presents a fascinating culture, a beautiful lifestyle and delightful experiences. Although often overtaken by its next-door neighbor in terms of seducing travelers from the rest of the world, it is every bit as beautiful, and equally exciting. As the second-largest country in the world, Canada has its fair share of national parks, protected reserves, glaciers, remote beaches, mountains and lakes. A holiday in Canada offers the perfect backdrop for adventure and brings you closer to animals such as the moose, whales and polar bears. The terrain itself is an amazing playground for activities such as snowboarding, kayaking, snorkeling, surfing, swimming and hiking, letting you leave the world behind and dive head first into the wild. Canada is a large, diverse country. A tour to Canada will teach you that the west coast and east coast of Canada have different cultures, cuisines, and traditions. Make the most of your visit to the Great White North by hopping between provinces. Canadians are known around the world for their friendliness and hospitality. Most locals will be happy to help if you need directions or restaurant suggestions. English is spoken all across the country, but be sure to know your basic French greetings if visiting Montreal or Quebec City. Canada has seasonal weather so please do check up on best time to visit Canada before planning your tour.